The Chiefs game on Sunday, Feb. 21 will be more than a game. It’s an opportunity to put mental health in the spotlight. 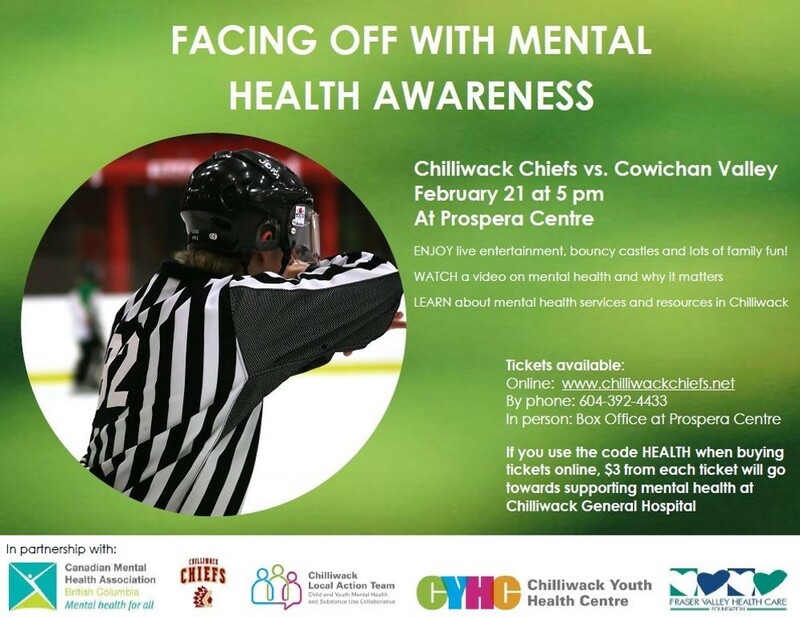 The Chilliwack Division of Family Practice has teamed up with the Chilliwack Chiefs for the Mental Health Awareness game, which will feature various mental health support and service agencies on-site, and the newly developed mental health awareness video. The video, released Feb. 16, includes youth and coordinators from Chilliwack’s Local Action Team (LAT), Chiefs players, family physician Dr. Melanie Madill, and Community Manager at the Ministry of Child and Family Development Dan Bibby, among others. The video aims to disassemble the stigma surrounding mental health, and to encourage conversations about mental health. A few months back, the Canadian Mental Health Association (CMHA) and the BCHL announced a new program Talk Today, aimed at providing hockey players and their families with mental health education and resources. Speakers in the new video discuss the realities of depression and anxiety, the importance of watching for warning signs in yourself and others, and they stress that you should not be embarrassed to talk about your mental wellness. “There is no better way to reach youth, than to have youth spread the message,” Chilliwack LAT coordinator Tatiana Carrizo said. The video features cuts between stills of youth and players holding signs that read “I pledge to talk today,” as well as the hashtag #TalkToday, which help to make the message relatable and effective for young people who might be struggling. Malcolm Thompson, 18, led the filming and editing process for the mental health awareness video. For him, the experience was eye-opening, which it likely will be for many who watch it at the game and online as well. After all, the best way to access services or ask for help is the way that you feel comfortable with, whether it be a trusted friend or an agency like the Chilliwack Youth Health Centre (CYHC). “Every door is the right door,” Bibby reinforced. The Chilliwack Chiefs Minor Hockey Night (vs. Cowichan Valley) and Mental Health Awareness Game is Feb. 21 beginning at 5 p.m. at the Prospera Centre. This family-friendly game night will be complete with live entertainment and bouncy castles, as well as important information and resources about local and regional mental health agencies. Tickets are available at the Prospera Centre box office, via phone at 604-392-4433, or online at chilliwackchiefs.net (using code HEALTH), $3 from each ticket go towards mental health programs and services at the Chilliwack General Hospital. The CYHC is a local hub for health care services, specifically for youth and young adults aged 12 to 26. They are open every Tuesday at the Neighbourhood Learning Centre and the Sto:lo Community Health Centre. For more information, visit chilliwackyhc.com.